The delightfully well-written and stimulating blog Cocktail Party Physics provides a history lesson about cholera epidemics and, along the way, highlights the account of an 1868 cholera epidemic in Buenos Aires as described by one Charles Darbyshire. Darbyshire’s fears proved well-founded when an epidemic broke out in the summer of 1868, brought about (he believed) by Brazilian ships tossing the bodies of those who had died from cholera into the River Parana, thereby contaminating the water supply. People in the cities fled to the countryside, bringing the disease with them, and Darbyshire soon found himself in the position of a public health leader, advising his neighbors on removing themselves from unsanitary conditions, not drinking water unless it was boiled, burying all refuse, keeping floors and patios clean. The 12 people in his own household did not contract the disease, which probably lent credence to his his advice. Despite all the deaths, there was one positive outcome: the Argentine government overhauled the city’s drainage system and installed a proper water supply. Read the full post at Cocktail Party Physics. I’m occasionally asked about good, cheap, affordable, low-cost hosting for Web sites. There are a lot of providers out there on the market. Before establishing this site, I did a lot of research on various hosting companies and ultimately selected site5. I’ve been with site5 for over two years and have never had a problem. So, site5 is the web hosting company that I recommend. The backend controls and tools to manage your site5 account are very nicely designed and easy to use. The company has an active forum for technical support and other issues. Many people know that I’m a librarian but may not realize as a librarian I managed Internet technologies for 15 years and was a Unix sysadmin, so I have very high standards for a Web host. I have no plans to change from site5 at anytime. Site5 always runs a lot of special pricing on new plans. I was lucky enough to get a plan a few years back that offered unlimited bandwidth. Yeah!! That plan is no longer available but they have a great new plan that is only $5 a month for 110 GB storage, 5 TB bandwidth, and that allows you to host up to 110 domains. This is NOT a sponsored post. I’m just a happy customer. Okay, there are affiliate codes in those links to site5, so I get some coin if you sign-up but I really am very pleased with the service of site5. …..we can return to talking about Buenos Aires now. Here’s a wonderful photo blog that I wished I had discovered sooner, when it was still active. Gustavo Romano is an artist in Buenos Aires who photographed the contents of his pocket everyday for almost three years. Looking at the photos is quite addictive and provides an alternative visual memory of Buenos Aires (and other places that Gustavo visited during those years). 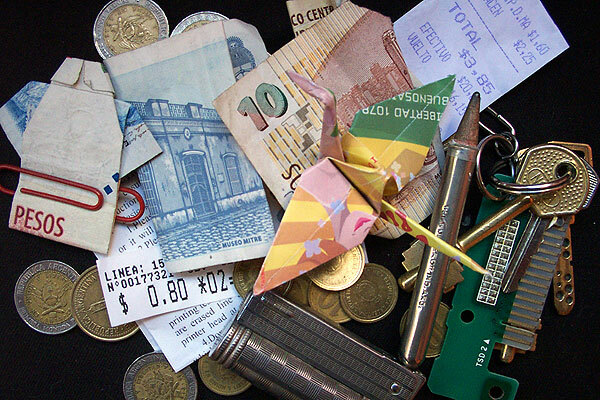 Anyone who has spent anytime in Buenos Aires immediately will recognize many of the objects that cross our paths and find their way into our pockets everyday. (The Pocketlog website is a little difficult to navigate. Hint: use the calendar at the top right of the page to move from day-to-day). Comments Off on What’s in Gustavo’s pocket? On one of my walks last week up Av de Mayo I decided at Congreso to turn left onto Entre Rios rather than my usual pattern of taking Callao into Barrio Norte. Back in 2003 when I was visiting BsAs regularly from Miami I often found myself on Entre Rios since I always stayed in an apartment near the intersection of Estados Unidos and Virrey Cevallos. But it had been a long time since I walked down Entre Rios and I had forgotten that it’s a relatively nice street. There are some very nice buildings…..
Of course, as you get further down Entre Rios the buildings are not in as good shape but still quite interesting. Actually, this one is quite odd. And, below, those blue curtains on the 2nd floor are not so hot but that top floor apartment looks wonderful. I actually couldn’t remember to which barrio this area belongs, so I had to look it up….and, drumbeat…well, actually Entre Rios is one of those boundary streets that (north of Independencia) serves as the border between Balvanera and Monserrat. Between Independencia and Garay, Entre Rios is the border between Constitución and San Cristobal. I ended up walking back through Constitución to San Telmo. And I just have to say, having wandered around Constitución several times, that except for the two blocks surrounding the train station, Constitución is not as bad as its reputation. Obviously it’s not Recoleta but most of Constitución isn’t any different than most of the other barrios in Buenos Aires. I’m starting an irregular series of posts, The City that Fades Away, about the old, abandoned, crumbling buildings around Buenos Aires. I find these buildings oddly fascinating. It’s likely that most of these buildings will not exist in another decade or two, either collapsing from neglect or demolished for new development. Many are already too far gone to be saved without significant financial investment, which isn’t likely or even feasible. So, as with an interest in documenting the past, here begins an occasional series on the city that fades away. Imagine the families that once lived in these places that now appear as nothing, apparently meaningless structures, waiting either for an end or a new beginning: the father loosening his tie after a day’s work, the pony-tailed daughter, eleven, brushing the dog’s yellow coat, the pet who shared her secrets with no one, not even her rambunctious little brother who at that moment is launching toy boats down the staircase rapids, while upstairs, in the dim bedroom, the mother stands before the window, staring down the cobblestoned lane, wondering if she had made the right choice years before. Lives once filled these buildings, like our own homes today, with the same mixture of happiness and sadness that comprises everyone’s journey through this world. Ultimately, it’s not just the architecture but the lives that once flowed among those walls, the lives that have faded away, that we should consider, celebrate, and honor. I guess this series really started with last week’s posting of the Middle Eastern style building in La Boca. Then today, in this posting, is a photo of an abandoned building on Bolivar street in Barracas, just a block behind where I live. I took that photo about two years ago but the building is still there, abandoned, looking not that much different. As I add other items and photos to this series, I’ll update this post with links. 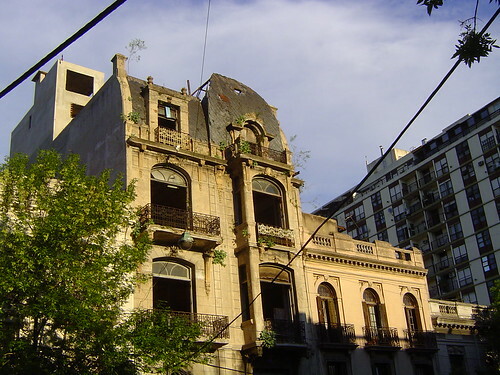 An invitation to bloggers (since everyone likes some link love): publish a post with a photo of an abandoned or deteriorating building in Buenos Aires (or wherever you like) and I’ll add a link to your post from this page. Robert, just returned from the other side of the world, was over for dinner last night talking about how Tangier is the next Buenos Aires. Sounds fascinating! And I remembered this building down Av Patricios in La Boca that brings a flavor of the Middle East to Buenos Aires. The ground floor is a cafe but the upper floors are clearly abandoned. Unfortunately, I couldn’t find out anything about the history of this building. Update: I went by this building again the other day and noticed some changes. The old restaurant on the ground floor has been replaced by a new Chinese restaurant. (One that’s not bad I might add). A guy also was coming out of one of the doors leading to the upper floors. So, it looks like this building is being saved and being put some use. Usually when I walk down Av Regimiento de Patricios, the boundary between Barracas and La Boca, it’s during the week when all the stores are open. A Sunday provides quite a different sight. I had never noticed that many of the metal shutters covering the closed storefronts are covered with reproductions of classic paintings. Ken is a good friend of mine from grad school whose 7 year-old daughter Hannah is participating in the Flat Stanley project. Hannah sent her flat friend, named Flat Hannah, to visit me in Buenos Aires. Here’s the story of my walk around Buenos Aires with Flat Hannah. On a sunny Tuesday morning Flat Hannah and I went for a walk around Buenos Aires. Our first stop was Parque Lezama, just a block away from my apartment. I like to go there many days for a long walk around the park. Flat Hannah wanted to have her photo made in the park. Continuing our stroll around the park we also saw the very blue domes of the Russian Orthodox Church, built in 1898. In this section of the park we also saw old men playing chess. I told Flat Hannah that those men are there just about everyday. Our walk then headed further up into the neighborhood where I live, San Telmo. This neighborhood, or barrio, is full of old buildings and cobblestone streets. Flat Hannah found it quite fascinating. Walking further into San Telmo we came across a dog walker. A lot of people in Buenos Aires have dogs and hire someone to walk their dogs during the day. The dogs seem to really enjoy their walks. In the background of this photo you can see a dog walker and his ten dogs. Then we made it to Plaza de Mayo, the main square of the city and, actually, of the country. There is a lot of history in Plaza de Mayo. Flat Hannah saw the Cabildo where the colonial government of Argentina was established and the Casa Rosada where the president of Argentina works. The Casa Rosada is kind of like the White House, except that it’s Pink. On the north side of Plaza de Mayo is the Cathedral. Flat Hannah really enjoyed seeing all these places around Plaza de Mayo and having her photo made. Before leaving the Plaza Flat Hannah posed for a photo at the end of Diagonal Norte, one of the main roads leading to the Plaza, and one of the many great avenues in Buenos Aires that is lined with beautiful buildings. Speaking of great avenues of the city, I just had to take Flat Hannah down my favorite street in Buenos Aires: Avenida de Mayo. Flat Hannah wanted to pose in front of the Plaza de Mayo subway sign. We walked all the way down Av de Mayo so that I could show Flat Hannah one of my favorite building in Buenos Aires: Palacio Barolo. This office building was completed in 1920 and was once the tallest building in Buenos Aires. Like a lot of buildings in Buenos Aires it was designed by Italian architect. The Italians left a huge mark on Buenos Aires and the architect of the Barolo was Mario Palanti. Flat Hannah found this all fascinating. She dreams of being an architect someday (bet you didn’t know that?). While we were looking at the Barolo she became excited about the building right next door, La Inmobiliaria with its red cupolas. This is another building also designed by an Italian. Flat Hannah liked this building so much that she just had to have her photo made twice in front of it. Just across from La Inmobiliaria, at the very end of Av de Mayo, is the Plaza del Congreso. The Congreso is the capitol building for the national government of Argentina. It’s quite an impressive building. This is also a good time to point out that Flat Hannah’s costume for the day was very appropriate for walking around Buenos Aires. She wore the blue colors of the Argentine flat and had a shining sun on her blouse, just like the Argentine flag. (She also had a dolphin on her outfit, but the flag doesn’t have a dolphin). Still, the outfit just by chance turned out to be very appropriate for her visit. Next to the Congreso is another one of Buenos Aires most fascinating buildings: Confitería Del Molino. Built in 1917 it is a great example of art nouveau architecture in Buenos Aires. Notice the trademark windmill at the base of the tower that gives the building its name. Unfortunately, the Molino has been closed for a number of years. Okay, now Flat Hannah and I continued our walk and next we came across another one of my favorite buildings in Buenos Aires: Palacio de Aguas Corrientes. Flat Hannah just loved the way that so many buildings in Buenos Aires are called Palacio. She giggled every time I said that”¦Palacio, palacio, palacio!! We had a lot of fun with that word (though we did get a few strange looks from passersby on the street)”¦.Now, back to the Palacio de Aguas Corrientes, which literally means the palace of running water. This building was completed at the end of the 1800s and was built to house the city’s water tanks. Inside this beautiful building are water tanks that hold almost 20 million gallons of water. That made Flat Hannah thirsty, so we stopped nearby to get a bottle of water. Next, we continued our wanderings and came to this lovely old church from 1732. Right next door to the church is the historic Recoleta Cemetery. It’s a fascinating place but I thought Flat Hannah was too young for a tour of the cemetery; I didn’t want to scare her. Maybe when she comes back in a few years for a another visit, then we’ll go. Meanwhile, the area surrounding the church and the cemetery is one of the top gathering spots in Buenos Aires. The area is a lovely park that’s filled with people on the weekend but is quite relaxing during the week, so we wandered around, sat under a tree for a while, took in some sun, then explored the shops in the Buenos Aires Design center. After our rest we got ourselves up for a stroll down Av Alvear, one of the fancy shopping streets in Buenos Aires. We stopped in front of the Ralph Lauren Polo store to gawk at the majestic architecture of that building. Flat Hannah remarked that they don’t have stores like that back in Tennessee! I told Flat Hannah that the building where the store is located was originally constructed by a family to be their house. And speaking of fancy houses that are now something else, we continued down the neighborhood of Recoleta to see some more fancy buildings. First is the embassy of Brazil, which is in a gorgeous structure that also was originally built to be a private home. Then just around the corner from the Brazilian embassy is the French embassy, yet originally another private residence built in 1913. Flat Hannah’s little legs were getting mighty tired by this point but we didn’t have much further left in our tour. We made our final stop in Plaza San Martín. This is one of my favorite spots in the city, very relaxing with its large trees and shaded benches. And for her final photo in Buenos Aires, Flat Hannah chose to pose in Plaza San Martín in front of the Kavanagh building, which was once the tallest building in South America. Flat Hannah and I had a wonderful day exploring Buenos Aires. She really enjoyed it and is looking forward to returning to Tennessee to tell her family and friends all about her trip. I hope to see Flat Hannah again in the future. She told me that she definitely wants to come back to Buenos Aires someday. And if she can’t make it, then someday maybe her big friend, real Hannah, will come for a visit.